Abstract : This paper presents a new approach to collision detection and modeling between deformable volumetric bod- ies. It allows deep intersections while alleviating the difﬁculties of distance ﬁeld update. A ray is shot from each surface vertex in the direction of the inward normal. 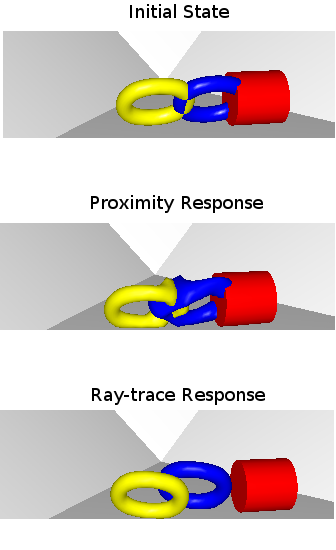 A collision is detected when the ﬁrst intersection be- longs to an inward surface triangle of another body. A contact force between the vertex and the matching point is then created. Experiments show that this approach is fast and more robust than traditional proximity-based collisions.